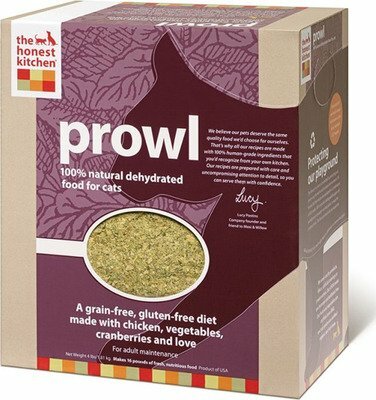 Pet Product Review: Prowl Dehydrated Raw Cat Food. Last week I reviewed Verve which was an organic dog food made with minimally processed grains and dehydrated raw beef. It did not go over too well with my pet. This week, I tried the a sister brand of organic food from the same company The Honest Kitchen – Prowl. As I mentioned last week, I really want to support these organic and very healthy pet food brands. The fact that I only want the very best for my pets is evident, and I’m willing to pay the additional costs for the products. But just like with the dog food, Prowl did not impress my cat Stinky. Despite following the instructions exactly, Stinky left any bits of this food in his bowl. In fact, he refused to go near the bowl even when I mixed the product in with his favorite canned wet food. It may have been the smell. Prowl is not for those with a sensitive nose. Again, I am sure that Prowl is an outstanding product with the highest quality ingredients; it is just not perferred by my pets. Do try the sample size first before spending the money on a large box.